With its launch, the Hydrology9 vaporizer is changing the way that people see vaporizers. It has been crafted expertly, indicating right off the bat that this new vaporizer is unlike any other. The vape features a totally leak-proof water filtration system, which helps cool down the vapor as it moves through the vapor path before it ever reaches your lips. The oven features an integrated stirring tool to ensure that your herbs are vaporized evenly every single time. The company responsible for the Hydrology9, Cloudious9, vowed to and succeeded in creating this vaporizer with only the highest quality materials possible. The vape is made out of aircraft quality aluminum, ensuring its users will never have to worry about it rusting. The porcelain oven delivers totally even heating and a crisp flavor that is impossible with any other oven material. Its boro-silicate glass vapor path ensures that only the pure flavor produced by this vaporizer makes it all the way to the user's lips. The Hydrology9 Vaporizer for dry herbs uses a topnotch 2000mAh lithium polymer battery, the same type used by safe cell phones. It only takes two or three hours to reach a full charge, which can outlast an impressive 15 or more sessions. Finally, this battery can heat the porcelain chamber to temperature in only 60 seconds, making this a vape that can deliver a powerful, yet smooth punch in no time at all. Using the Hydrology9 vaporizer is about as simple as it gets, even though it is full of interesting features. The vaporizer features a bottom cap and stir tool that pops right off. Load in your freshly ground herbs, making sure you always grind them as finely as you possibly can. Be sure that you do not accidentally load past the top fill line. Replace the cap and the stir tool back onto the vape. Unscrew the mouthpiece next. Once you make sure that all of the parts of the Hydrology9 are screwed down tightly you can fill the water reservoir. You only want to fill it to the top portion of the reservoir. Finally, turn it on, vape, and go. The Hydrology9 by Cloudious9 is a water filtration vaporizer. Unlike any other sort of vaporizer for dry herbs on the market, this handheld technically portable vaporizer features the ability to hold a tank of water inside of it, which serves to run your vapor through the water first to help smooth it out, give it great flavor, and comfortable, cool hits. It uses an ultra-powerful 200mAh lithium ion battery that can last for an impressive 90 minutes on one charge and only takes around two or three hours to charge using the USB charger that comes included. The Hydrology9 by Cloudious9 features five different temperatures for you to choose from, and these are indicated by five different colors. It only takes 30 seconds for the Hydrology9 by Cloudious9 to heat up. It comes with a borosilicate glass mouthpiece or vapor path which furthers the flavorful, smooth vapor that you get. It has a porcelain chamber that combines with the glass components and the water to bring you a pure and unadulterated flavor. It feels good in the hand and has a pleasant weight, making it comfortable to tote around the home. The Hydrology9 by Cloudious9 is a water filtration vaporizer and the first of its kind. Totally portable, it provides smooth, flavorful vapes that cannot be beat by way of its water filtration system, its borosilicate glass vapor path and its porcelain chamber. - Price - The Hydrology9 by Cloudious9 costs $249 dollars, which is a bit more expensive than some others. That said, there is no other like this one, so it makes it more than worth it. - Vapor Quality - The vapor quality of the Hydrology9 by Cloudious9 is excellent. This is due to the water filtration system that it boasts. This is also because it has a porcelain chamber that produces ultra-clean and smooth vapor. Vapor produced on porcelain is also refreshingly aromatic and flavorful due to its pure design which will not leech any flavors onto your herbal blends. Not only this, but it has a borosilicate glass body and mouthpiece. The glass vapor path through and through ensures that the flavor remains untouched as it travels to your lips. - Guarantee - The Hydrology9 by Cloudious9 comes with a limited two-year warranty. This warranty covers the vaporizer but will be voided if it has been misused in any way. This includes modifications, tampering, abuse, misuse, or neglect. - Prep Time - It takes only a few seconds for the Hydrology9 by Cloudious9 to heat up, making prep time minimal. It also is simple to pack so that you can enjoy a nice vape whenever you please. You have to fill it with water occasionally too, but that takes no time at all. - Portability - The Hydrology9 by Cloudious9 is technically a portable vaporizer. That said, it is a bit larger than some others due to its unique water filtration system. For this reason, it should be considered an at home handheld vaporizer and used that way instead of taking it with you wherever you go. - Ease of Use - The Hydrology9 by Cloudious9 is simple to use. Packing it takes no time at all, and it features an easy to see and press fire button that delivers vapor right away. It has a magnetic cover and mouthpiece that makes it simple to pop off and load at your convenience as well. - Heating and Temperature Regulators - With the Hydrology9 by Cloudious9, you get five different temperature settings to choose from. These range from blue, yellow, orange, purple and red, starting with blue as the lowest and red as the highest. The Hydrology9 by Cloudious9 also uses a porcelain chamber. - Power Supply - The Hydrology9 by Cloudious9 comes with an ultra-powerful 2000mAh lithium polymer battery that heats the porcelain chamber with ease. This battery is a safe cell phone grade battery. It can charge in only two or three hours and will last for around 90 minutes on a full charge, or around 15 sessions. Ensure that the Hydrology9 by Cloudious9 is charged completely. This means plugging it into the included USB charging cable and letting it charge for two or three hours. Unscrew the top lid of the Hydrology9 by Cloudious9. Fill up the water around 3/4 of the way full into the water chamber. Unscrew the cap that is on the bottom. Fill it with dry herbs. Toggle the air intake to your liking using the section above the chamber opening. Press the power button five times in rapid succession in order to turn it on. Press the button once to change through the temperature settings. The lights inside of the water tank will show you a color-coded indicator of what the vape is currently at. Press the fire button to vape. You can vape for up to 90 minutes or around 15 sessions at a time. The Hydrology9 Vaporizer for dry herbs comes with a two year limited warranty. This warranty applies only with normal usage of the product. It is only valid for the original purchaser. The warranty will be voided if the product has been neglected, abused, modified, misused, or broken. It is only valid for issues with workmanship and defects from the manufacturer. Keep in mind that some states do not allow for limitations on warranties, so some of this might not apply to your state. If you have doubts, it is important that you research for more information. Finally, the purchaser is the one responsible for the shipping costs if a product gets returned. These costs are nonrefundable. The body of the Hydrology9 vaporizer is made from an aluminum alloy that is considered space grade or aircraft grade and has been anodized for strength and longevity. This ensures the body will never rust, which is especially important considering this vaporizer uses a water filtration system. The water filtration system is totally leakproof and serves to cool down the vapor as it travels through the vaporizer, ensuring the vapor that touches your lips will be monumentally cooler than what is produced in the heating chamber. This will offer a cooler, smoother vape experience every time. The glass used in the mouthpiece of the Hydrology9 Herbal Vaporizer is boro-silicate, extending down to the glass vapor path that ensures the vapor will be flavorful and pure. The vapor comes from the food grade porcelain heating chamber, as porcelain produces the purest possible vapor, free from any other flavors. The battery in the Hydrology9 Vaporizer is a 2000mAh lithium polymer battery. It only takes two to three hours for the battery to charge. Once it has been fully charged, it can outlast around 15 sessions. To heat up the Hydrology9 Vaporizer for herbs only takes approximately 60 seconds. I have only had this product for a few days time, but it is already my new favorite and definitely my go-to. It definitely lives up to its name and the promise of an excellent vape experience. I recommend this vape for special occasions and to give it the attention that it deserves. This is a vape that all of my friends love me to break out and they all talk about how well it hits and how smooth it is, and I can't say that I disagree. If you want a top quality vape, look no further than this one. Hits like a water pipe - Review by Stanley J. If you want something that is similar to a bong but way better because you won’t experience the burning in your throat, this vape is definitely for you. I love it because it hits like a water pipe should but without all of the waste that comes along with it. This vaporizer is smooth to hold and smoother to hit, and even after being a long time vaper, I knew from the very first hit that I found my new favorite and a new reason to keep vaping. It is sturdy and reliable despite its glass composition. LED lights look great - Review by Ron P.
Knowing that the vapor passes through two different filtration systems before it gets to me is great. I can definitely taste the difference compared to other vaporizers. This vape hits like a charm and does not have that somewhat harsh burn that other standard vaporizers do. The aroma is faint but the flavor is outstanding and tastes just like a real vaporized herb should. I love breaking this out at parties and seeing all of my friends’ faces. Plus, the awesome LED lights look great when I choose to vape it at night, and it gives me something to look at when I get bored while vaping. Excellent drawing power - Review by Henry S.
The vape has excellent drawing power and does not take too much lung power to use, offering a smooth and comfortable hit every time. The hits are exceptional and tasty, something that I look for in a vaporizer. Each one is smooth and comfortable since it passes through the water first. I recommend this to everyone. Some people think that this should be a special occasion vaporizer, but it has definitely become my most used vaporizer out of all of the ones that I own. Get this if you want to vape, but don't want all of the heat and the burn. 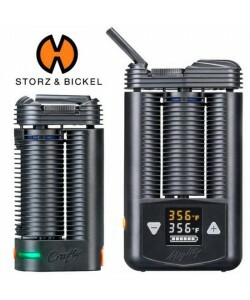 This vaporizer easily climbed its way up to the number one spot of my favorite vaporizers. It charges easily and quickly, so it is always ready to vape whenever I am. I have noticed that it can go around six or eight vaporizing sessions before needing to be recharged, so I would say that it is pretty efficient on the battery. The flavor is unmatched and the vapor is crisp and comfortable to inhale. This vape offers a combination of benefits that is hard for me to find in any other vape. Hydrology 9 will get you cooked, and save you the trouble and money of rolling. This vaporizer by Cloudious9 hits like a charm. Easiest to hit vape - Review by Mateo V.
The Hydrology9 vaporizer for herbal use is one of the smoothest, easiest to hit vapes I've ever tried. I think the water filtration system is truly ahead of its time and makes all of the difference in the world. I think when you combine it with the glass mouthpiece and the porcelain chamber, it produces a smooth and crisp flavor unlike anything else. I'd definitely buy this again. Gorgeous Vape - Review by Richard Q. Never thought I'd call a vaporizer for herbs, Gorgeous, but it truly is! Sits on my night stand like an art work, plus the changing light setting is amazing! I use this vaporizer for special occasions, but I know someone who uses it every single day as a casual vape. It feels really good in the hand and is easy to load and to use in general, so I imagine it's a great everyday vape. 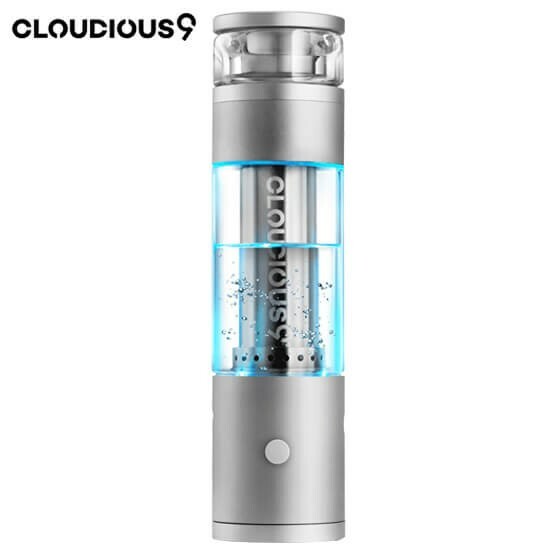 Well done cloudious9 - Review by Anna W.
Easy to use - Review by Jackie D.
The Hydrology9 Vaporizer for dry herbs is so easy to use, I have replaced all of my other vapes with this one. It's the only one I use anymore. The flavor that it produces is unlike anything else I've ever tried out before. Best gift ever - Review by Karen M.
I really like VaporPlants, thanks again guys! This is my second order with them, and all is smooth as the first one. The Hydrology9 is just what I was looking for, a bong style vaporizer that is portable and uses no flame. I'll never use anything else. Nothing else has made my herbs taste the way this does, and nothing else will ever hit as smoothly as this one does. I'm sure of it. Just fantastic, really does the job well!